I am so pleased to have the chance to introduce to you Brian Haggard. 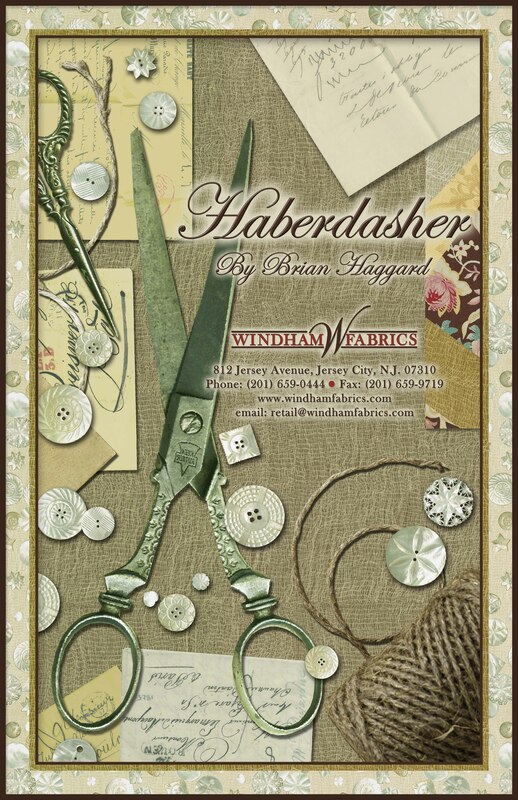 Brian is very excited about the launch of his Haberdasher collection for Windham Fabrics. 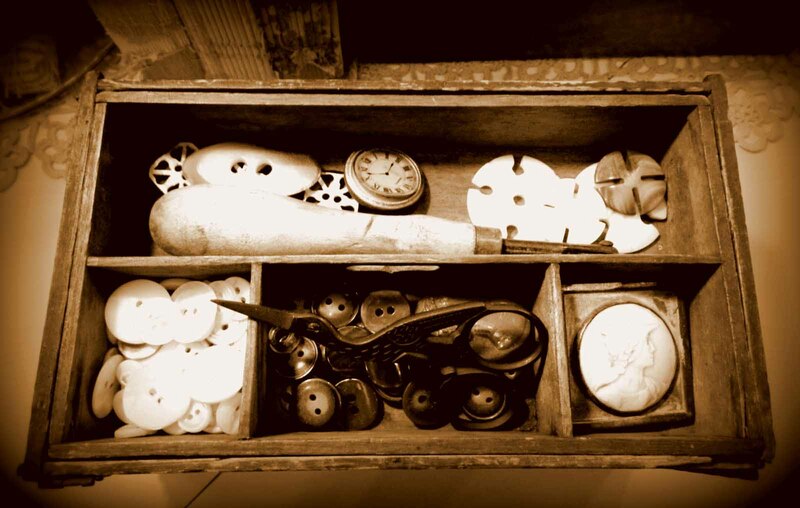 Haberdasher incorporates Brian’s love of classic design, antiques and sewing memorabilia, especially his love of vintage buttons, in his signature sepia palette. Haberdasher will be available to view on the Windham Fabrics website September 1st and will be in stores January 2013. Brian will be teaching a Schoolhouse at the International Quilt Market in October. Make sure you keep your eyes peeled for this one of a kind collection. Hello, my name is Brian Haggard. I am a crazy-quilt artist and author living and working in Indianapolis, Indiana. 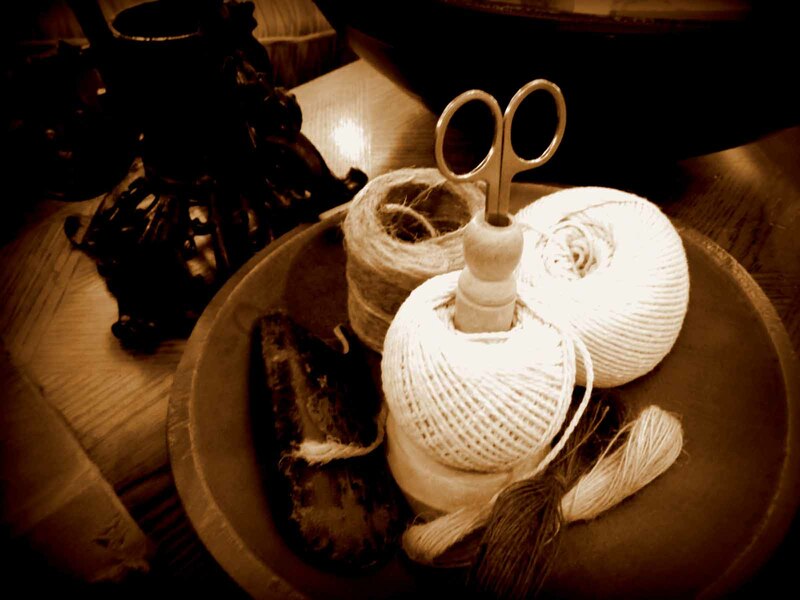 I am known as The Crazy Haberdasher for one reason: my affinity for all things textile and tactile. 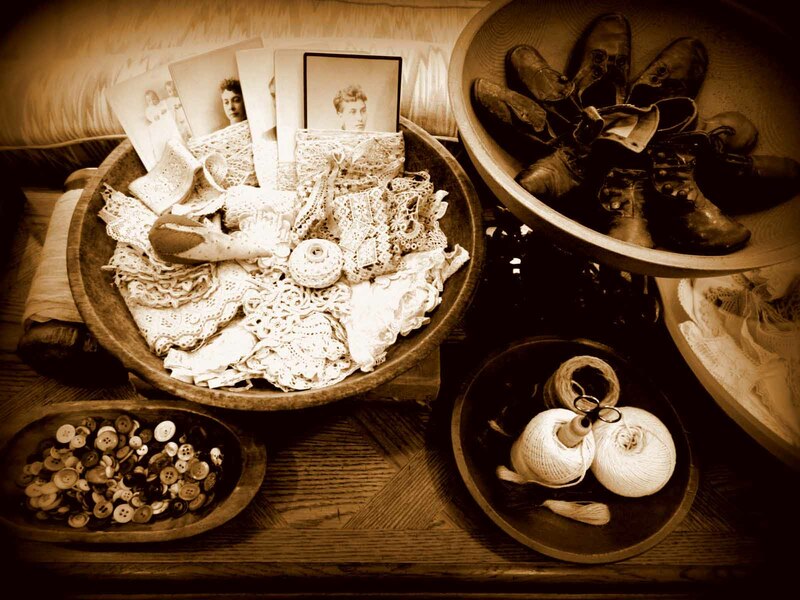 In my studio you will find many things in jars, baskets, and wood bowls. Not only does it display beautifully but it's great for having my stash at my fingertips to quickly and easily find things without looking through a stack of totes. I find that if it is out and easily seen we can walk by and grab it without losing creative flow. If you go out into the world with an open and creative spirit you will find these things in your day-to-day living. Ask yourself these questions: what can I do with that; how can I use it differently; how can I create something with that; what does this project mean to me? Sometimes you simply have beautiful things you just want to put together. It has long been a dream of mine to create yard goods that look like the 8 1/2 x 11 sheets that I have printed with my computer for many years. The collection you see before you is my dream coming true. I hope you enjoy them as much as I have enjoyed making them. The creative team at Windham has been such a great pleasure to work with. The excitement of seeing this collection come to market is more than just a dream–it is the creative process in its truest form. It's hard for me to believe that only a few years ago by creating a crazy-quilt as a Christmas gift would I be writing books and designing fabrics. I've been able to take the items around me and the ideas running through my head to create this fabric collection. With my background in interior design, I do believe that I see things a slightly differently and put a little twist on tradition in my work. I'm happy to say that this fabric is one of my proudest achievements. I hope these fabrics will inspire you to work with the treasures from your family and friends to create memories that will last forever. It will be an heirloom to hand down to your children or grandchildren and tell the stories of your life. For me making something new from things of old is a passion and drives me to look for the newest, the oldest or the latest and greatest. I love to discover the secrets of the past to them to share with the future. Anytime I can find that key thing that is slightly outside the box–I'm there. So my dear friends, until we meet, let the fabric before you inspire you to create textile pieces for all the generations. I bid you great stitching. 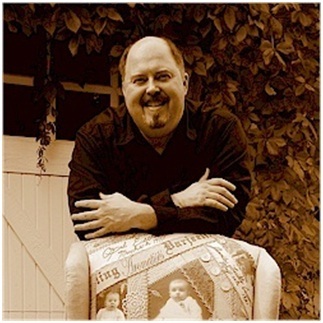 Brian Haggard, author of Crazy-Quilted Memories and Embroidered Memories and designer of The Haberdasher Collection by Windham Fabrics. Well I am certainly looking forward to his Haberdasher Collection! His Crazy Quilted Memories book is just fantastic! 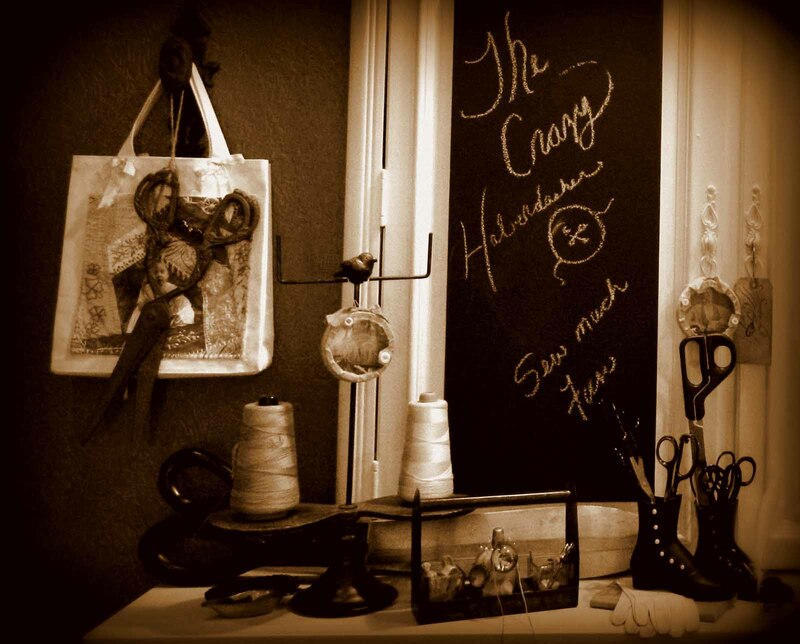 I love crazy quilting and look forward to seeing the new line. Love Brian’s work. I have just seen a preview of his new book on Amazon….I could not push the “Order It” button fast enough. I will be looking forward to seeing this line of fabrics.